At the beginning and end of each day all food preparation, food surfaces, appliances and eating areas are wiped down with an antibacterial cleanser and paper towel. Areas used for food preparation are wiped down just before use throughout the day. Children’s eating utensils are washed in the dishwasher. Hand washed items are done with antibacterial washing up liquid soap. Hand washing is a practice before eat any food. To avoid choking hazard and as a part of our curriculum all the children eat at the table. No one can leave the table with food in his or her hand or mouth. Water, nutritious snacks are provided by the daycare in the morning and the afternoon. 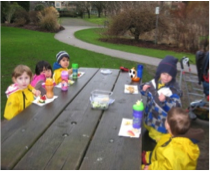 We can provide warm snacks especially during the colder months, if your child is younger than 18 months, lunch will be provided by the parents unless arrange of food. In this case, the lunch ;must be nutritious and must contains food for each of the four food groups. Treats like candies, popcorn, chips, gum, or other sweets in their lunch box are not allow, for two reasons they are not nutritious and they cause problems with the other children that prefer to eat the treats instead of their lunch. If your child has any food allergy or sensitivities please let me know, to take measures. The measures will consist in avoid completely the food that could cause the allergy reaction, making the environment free if it. As well to coordinate with parents and nurse in extremely acutes cases specific measures. We celebrate birthdays and other special occasion with homemade cookies or cup cakes. The birthday’s boy or girl only blow a candle in an special ceremony not in the food. The grapes, baby carrots, hot dogs must be cut in half. Food served: during the day will include serving from each of the four food groups and will be posted in the activity board. You may bring special treats for birthdays or celebrations as long as you let me know in advance. Give the children sufficient time in which to comfortably consume meals and snacks. If a child has a particular dietary need, substantiated by a medical evaluation, I must be informed and given a doctor’s note. Substitute meals or snacks may then be brought from home.